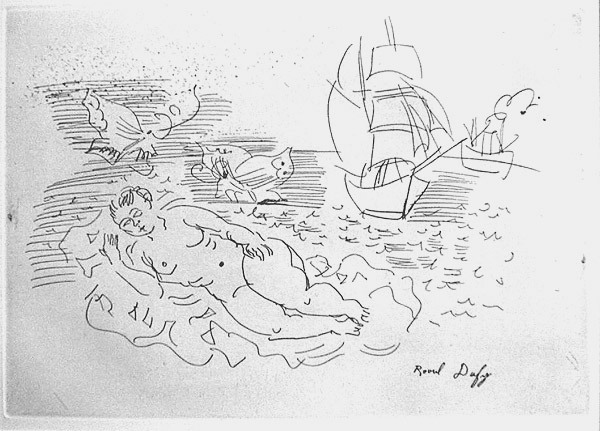 Raoul Dufy was one of the most popular artists of the first half of the twentieth century. He was also popular with the critics, winning the prize for painting at the 1952 Venice Biennale. He was drawn successively to Impressionism, Fauvism, worked with Braque in the first decade of the century before coming under Cezanne's spell, before finally synthesizing his own personal style in the 1920s. 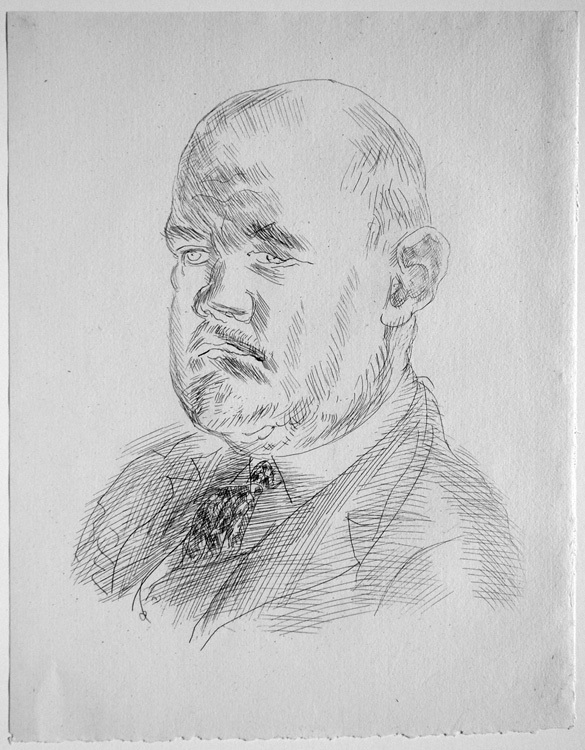 He was one of Ambroise Vollard's stable of artists (along with Renoir, Rouault, Chagall, and many others), and the portrait of Vollarf pictured below suggests that he has captured the Vollard whose grasp always exceeded his reach, a man who strove for perfection without ever feeling that he had achieved it, who commissioned many projects but completed very few. Selected Bibliography: Guillaume Apollinaire, Le Bestiaire ou Cortège d'Orphée. Translated by Lauren Shakely. 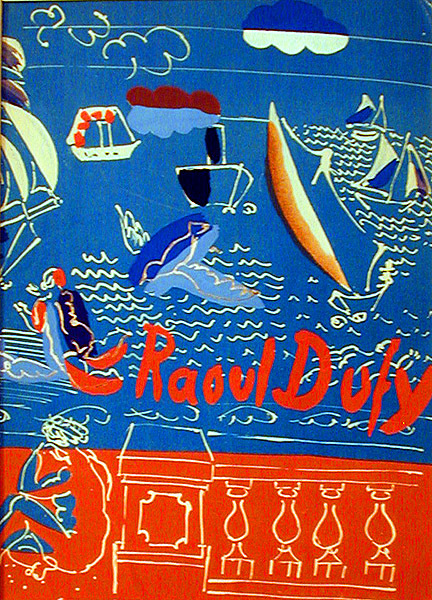 Illustrated with woodcuts by Raoul Dufy (NY: The Metropolitan Museum of Art, 1977); George Besson, Raoul Dufy (Paris, Ed. Braun et Cie, 1953); 100. Pierre Camo, Raoul Dufy; l'enchanteur (Lausanne: Marguerat, 1947); Jean Cassou, Raoul Dufy 1877-1953. Catalogue par Bernard Dorival. Musée National d'Art Moderne Paris (Éditions des Musées Nationaux. Paris. 1953), Jean Cassou et al, Raoul Dufy , 1877-1953 (San Francisco Museum of Modern Art, 1954); Raymond Cogniat, Raoul Dufy (London: Tate Gallery, 1954); Raymond Cogniat, Raoul Dufy (NY: Crown, 1962); Pierre Courthion, Raoul Dufy (Geneva: Pierre Cailler, 1951); Raoul Dufy: A Retrospective (Daytona Beach: Museum of Arts and Sciences, 1979); Manuel Gasser, Raoul Dufy 1877 - 1953. Welt in Farbe Taschenbücher der Kunst (München: Desch Verlag, 1955); Maximilien Gauthier, Raoul Dufy (Paris: Flammarion, 1955); Fanny Guillon-Lafaille, Raoul Dufy. Catalogue raisonne des aquarelles, gouaches et pastels. 2 volumes (Paris: Louis Carre, 1981 & 1982); Maurice Laffaille, Raoul Dufy: Catalogue raisonné de l'oeuvre peint. 4 volumes (Genève: Editions Motte, 1972 - 1977; supplement 1985); Jan Lancaster, Raoul Dufy (Washington D.C.: The Phillips Collection, 1983); Dora Perez-Tibi, Raoul Dufy (NY: Abrams, 1989); Guido Perocco, I Maestri del Colore: Raoul Dufy (Milano: Fratelli Fabbri Editori, 1965); George Salles, Hommage a Raoul Dufy (Nice, France: Galerie des Ponchettes, 1954); René Ben Sussan, Raoul Dufy Paintings and Watercolours (NY: Phaidon, 1958); Alfred Werner, Raoul Dufy (NY: Abrams, 1973); William H. Wilson, Raoul Dufy: A Retrospective (Sarasota, FL: Ringling Museum of Art, 1978). Femme Nu Assise. Original etching, c. 1930. 52 signed and numbered mpressions on buff laid paper of which this is n. 11/52. Some foxing right above the bottom plate mark and at center right. Image size: 230x185mm. Price: $2500. 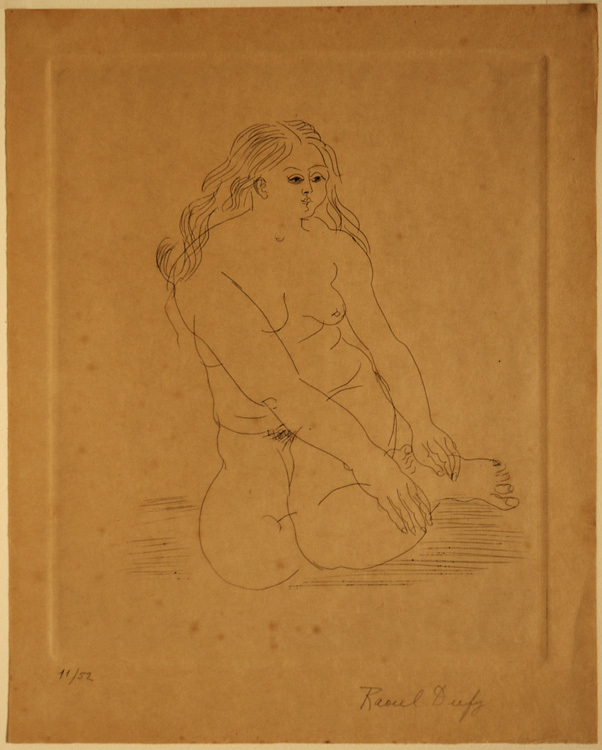 Femme nue assise se peignant / Amphityre. Original etching, 1930. 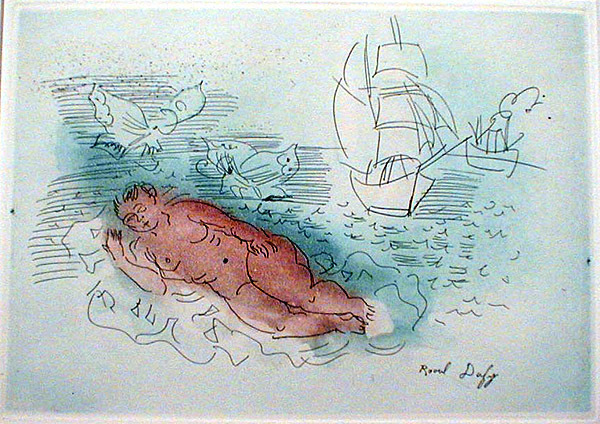 The etching is the frontispiece of the book Raoul Dufy by Marcelle Berr de Turique (Paris: Librairie Floury, 1930. 200 deluxe copies of the book numbered from 1 to 200 were printed with the etching on japon paper together with a regular edition from which our impression comes, consisting of an undetermined number of copies with the etching signed in the plate printed on stiff laid paper. Image size: 196x136mm. Price: $1250. Ambroise Vollard (Johnson 186). Original etching, 1930. 50 signed impressions plus 625 unsigned impressions. Published as the frontispiece to Vollard's Complete Catalogue of Graphics (1930). Ours is one of 500 impressions printed in black ink. Vollard, one of the great print entrepreneurs of the 20th century, is a key figure in the popularization of modern art. He commissioned prints from Chagall (including the Dead Souls, the Fables of La Fontaine, and The Bbile, Renoir, Rouault (Miserere), Roussel, and many others; he published works by Bernard (The Odyssey), Bonnard (Parellelement, Daphnis and Chloe), Cezanne, Degas, Denis, Dufy, Morisot, Picasso (the Saltimbanques and The Vollard Suite), Redon (The Temptation of St. Anthony), Renoir, Vuilliard, and many others The plate was cancelled after printing. Image size: 230x200mm. Price: $1750. Baigneuse. Original etching, c. 1930. Signed in the plate. 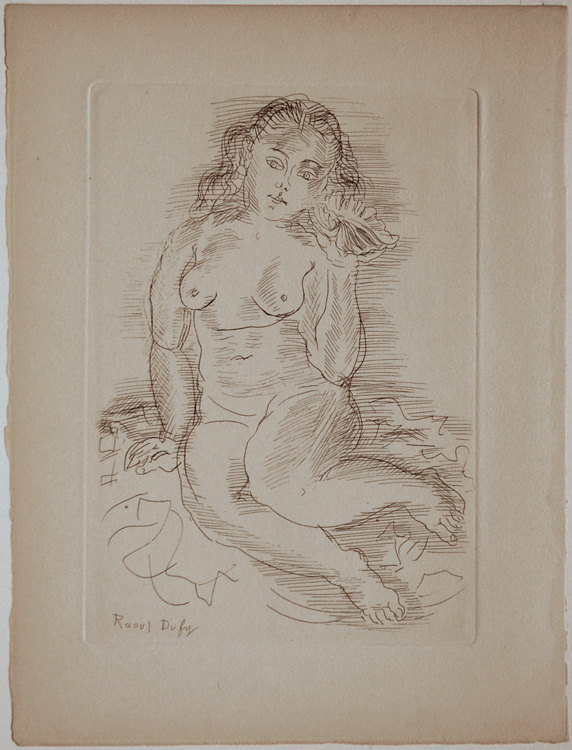 Una Johnson suggests that this etching was commissioned by Vollard for a porfolio of original etchings by Dufy, Matisse, Rouault and others. It was never editioned, and only a limited number impressions were printed. See Una Johnson's Museum of Modern Art exhibition catalogue, Ambroise Vollard Editeur. Image size: 222x312mm. Price: SOLD.